Just as with all the other details, the wedding bouquet should also be exclusive and chosen in agreement with your own personal style; however, it should also be in harmony with the bride’s body type, as well as with the overall style of the wedding. 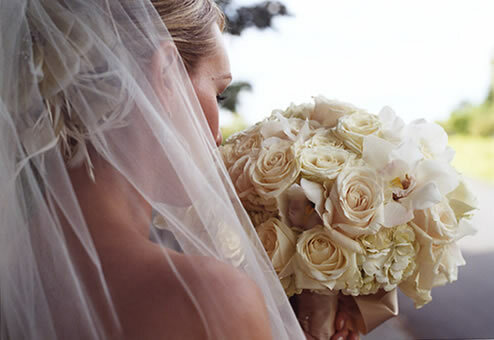 As with all the wedding choices, no detail should be overlooked, including the bridal bouquet and its flowers. 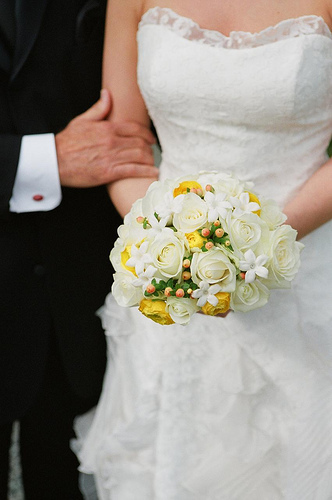 As a perfect match to the bride, there is nothing lovelier than a white wedding bouquet. In this case, it’s possible to exaggerate a little bit – with the size of the bouquet or in the combination of flowers with different textures. As long as the bride isn’t very short, the bouquet may be large because the color of the flowers won’t steal away from the bride’s look. 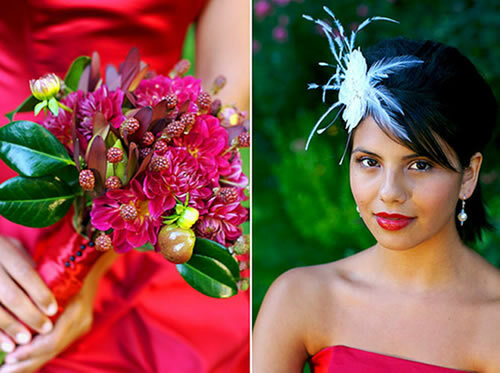 The flowers’ textures will be the star of the bouquet, which is perfect for a more formal wedding. On the other hand, if there is something that can easily tire any bride it is a large and heavy bouquet. 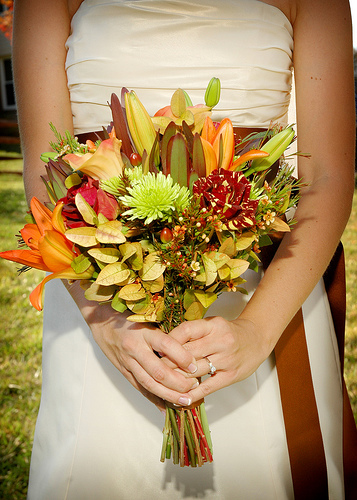 A small bridal bouquet, made up of two or three types of flowers could be a great idea for a more practical bride. 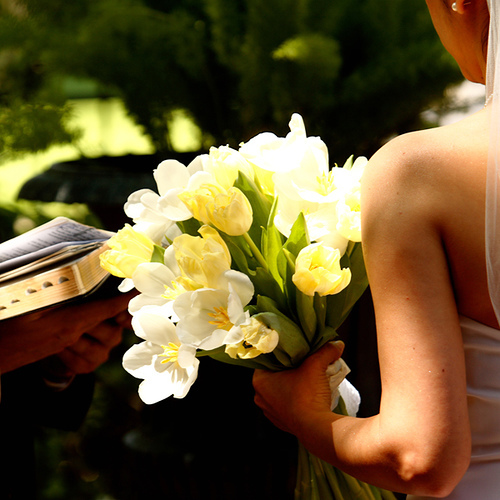 If the bride is short in stature, a small bouquet is also the recommended size. 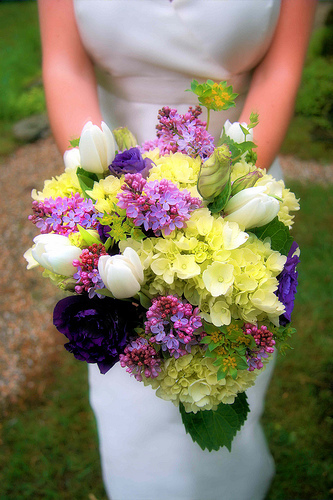 The wedding bouquet’s style can be simple without being invisible. 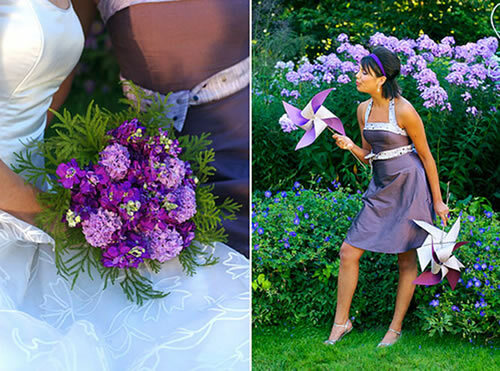 Different shades of color and a more casual flower arrangement can produce a very original wedding bouquet. 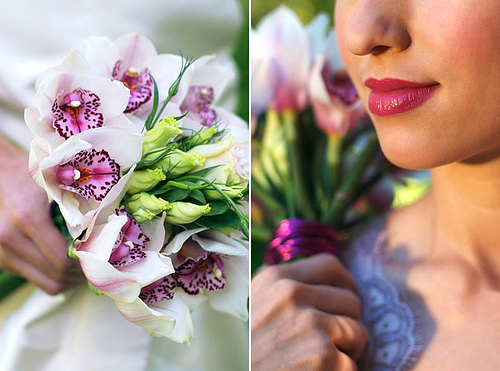 A wedding bouquet composed of orchids is always beautiful and romantic, and is always a great option because besides being resilient, these flowers are available year round. If you’re going to be the type of bride that plans to reveal her style in a very bold fashion, than the wedding bouquet should follow along the same lines: the style, the texture and the color of the flowers chosen for the wedding bouquet should be in perfect harmony with the bride’s own personal style and personality. Tulips are extremely elegant and a bouquet of tulips tied together with a silk bow will always be an elegant and chic wedding bouquet. However, keep in mind that tulips continue to grow even after they are cut, so the wedding bouquet should be arranged right before the bride takes it in her hands. 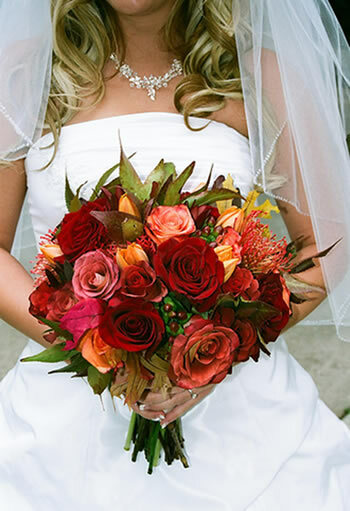 The wedding’s color scheme may or may not contemplate the bridal bouquet because the bouquet is a very personal choice and does not necessarily have to match anything else but the bride and her style. If you plan to match the bouquet to the wedding’s color scheme don’t choose flowers that are the same as the rest of the flower arrangements, just in the same shade. 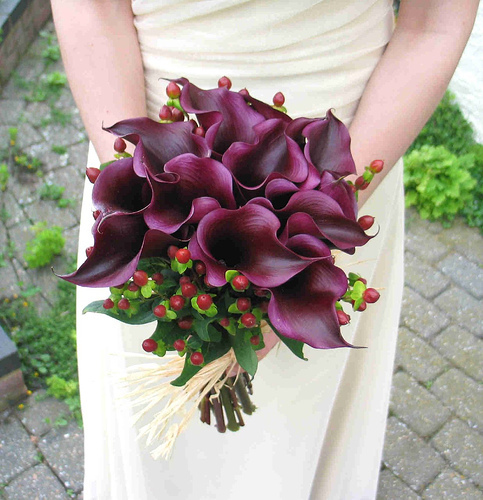 Lilies, especially the colored kind, are flowers that are often used in wedding bouquets due to their durability and format. You may opt for a simple bound bouquet composed entirely of lilies or complement them with other, smaller flowers, which will not outshine the lilies. If you’re going to have an outside or eco-chic wedding, where Mother Nature is the great inspiration, than a wedding bouquet composed strictly of rural or country style flowers could be a wonderful suggestion for you. If you’d like to add a splash of color to your look or simply prefer a colorful bouquet, than choosing various types of flowers with distinct textures, but in complementing colors, could be a great suggestion: a colorful wedding bouquet that is very original and anything but invisible.